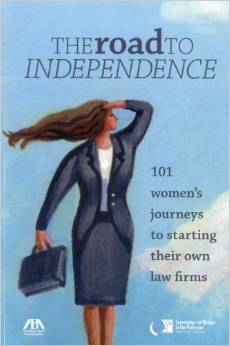 The Road to Independence is a collection of 101 letters from women who have taken the courageous and difficult step of creating a law firm of their own, either as a solo or with others. Focusing on the experiences, challenges, and opportunities of women-owned law firms, these women, in their personal voices, reiterate key themes: Of becoming businesswomen. Of choosing a practice area true to their passion and the high character they bring to the bar. Of controlling not only their days but their destinies. Of ambition in action. Women continue to face significant barriers and obstacles at law firms in this country; thus, it is hardly surprising that more and more women are opting to create their own firms. Throughout this inspirational book, the reader will find business-savvy tidbits and practical tips for starting and growing a successful law practice in the words of the founders themselves. Grouped chronologically according to when each writer started her woman-owned practice, this collection implicitly portrays the profession’s growth, the society’s evolution, the economy’s fortunes, and the periodic changes in business models of private practice. Explicitly, these letters unite to reflect not only the drive to practice law but also, the impact of those cultural changes on women in private practice. The letters compiled in this book reflect the voices of women who are happy with their practices, proud of their entrepreneurial spirit and business development skills, and eager to share their advice with others who may be emboldened to follow in their footsteps. 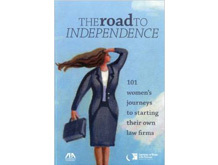 The Road to Independence will serve as a catalyst, guide, and inspiration for other women who are contemplating the possibility of setting out on their own.